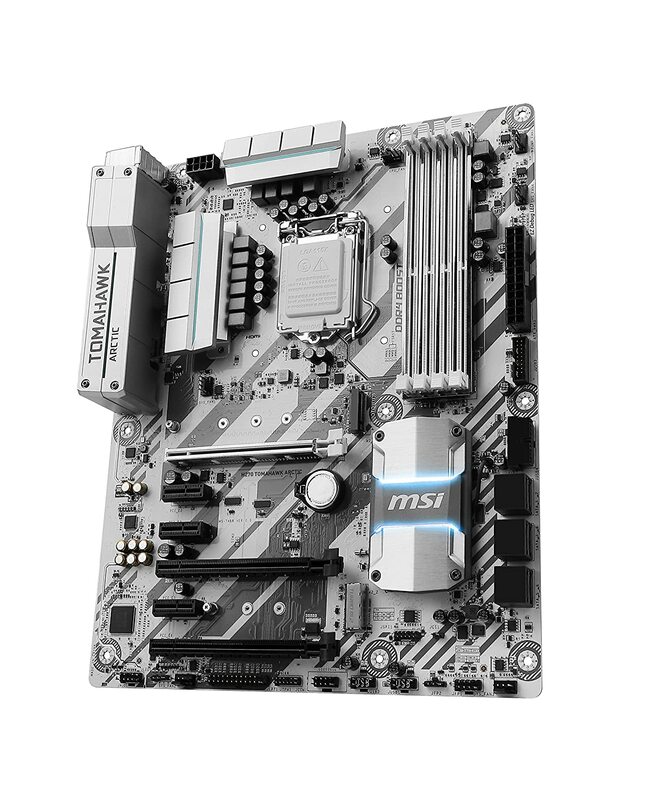 Hailing from MSI’s Arsenal Gaming range in Intel motherboards (a series based on military themes and presenting gaming-centric features), the MSI H270 Tomahawk Arctic also represents the first H270-based board we’ve had in the APC lab. 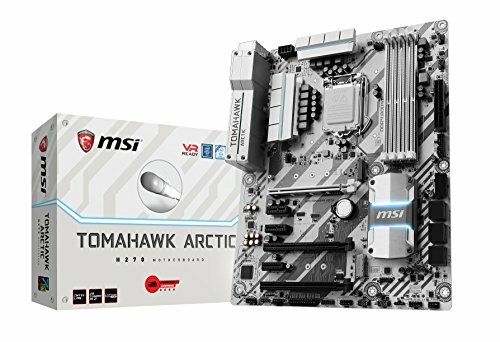 The Tomahawk is also available in a Z270 variant, the aptly named Z270 Tomahawk (black-red color theme) and MSI H270 Tomahawk Arctic (white-blue in color). The core differentiators between the Z270 and H270 based variants of these boards is the inclusion of overclocking, specifically support for K-series CPUs and memory frequencies greater than DDR4-2400, and an extra four PCIe 3.0 lanes on Z270 (24 lanes for Z270 versus 20 lanes for H270). If neither of these attributes concerns you, the H270 variant will — for the most part — deliver a comparable experience for the average user — those who aren’t fussed about tweaking for additional performance beyond stock defaults or using numerous PCIe based storage and expansion devices. Understanding the PCIe resource allocation on this motherboard is important to making an informed purchasing decision. Due to having more PCIe-based connectivity options than PCIe lanes available to the platform, resources are shifted around the motherboard’s features to meet connectivity demands — meaning you can’t expect to use all the features at once. For example, the second PCIe xl6 slot (operating at PCIe x4) disengages and reallocates the PCIe lanes to the second M.2 port when a device is installed in the M2_2 port. Similarly, when PCIe slots #3 and *6 are used, this disables slots #2 and #5 as the PCIe lanes are shared. Furthermore, be mindful that the second and third PCIe xl6 slots are running PCIe x4 and PCIe xl link speeds and only the primary PCIe xl6 slot has full 16 lanes of PCIe connectivity. Due to the second PCIe xl6 having an x4 link, only AMD CrossFire is supported on this platform, with Nvidia SLI specs requiring at least x8 link speed for each GPU. On the back, the rear I/O is reasonably well kitted out, providing two USB 3.1 ports across a Type-A and Type-C port combo, four USB 3.0 ports and, finally, a couple of USB 2.0 ports too. Also present are HDMI and DVI-D outs, a PS/2 port focused towards gaming-related peripherals and an audio I/O stack with five 3.5mm sockets supporting 7.1 surround sound paired with an optical link, supplied by the Realtek ALC891 codec. The rear I/O is rounded out by the inclusion of an Intel i219-V backed Ethernet port with a software layer that facilitates gaming QoS prioritisation via the MSI Gaming LAN Manager app, scoped to deliver reduced latency and thereby a smoother online gaming experience. The ever-present RGB support is delivered by a single RGB header on the bottom left of the ‘board. This is controlled by the MSI Mystic Lights Sync software and allows individual configuration or synchronization of the RGB header, supporting MSI RGB expansion products (read: GPUs) and third-party vendor hardware solutions from the likes of Corsair, G.Skill, Cooler Master, In Win and others. Overall, this is a nice board with good features — so long as your needs fit within the scope and function of its ‘juggle things around’ design. If your needs fit the scope of this board, then you’re in for an enjoyable user experience at a decent price.